Equine Assisted Learning emphasizes education, personal and professional growth, and developing life skills that can influence team dynamics. Outcomes often include more effective communication, increased assertiveness, enhanced creative thinking, improved problem solving, and more effective leadership and team building skills. Increased confidence is also typically realized after participating in EAL sessions. 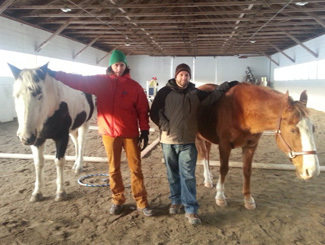 Berkshire HorseWorks™ uses the EAGALA Model to facilitate Equine Assisted Learning sessions for individuals, couples, families and organizations. Typically, we offer 60 minute sessions for individuals and couples; 90 minute sessions for couples, groups, families; and half-day, full-day and extended customized workshops and retreats tailored for learning goals and staff development programs for organizations. Through customized EAL programs, Berkshire HorseWorks helps facilitate team building and skills development for organizations of all kinds: corporations, boards of directors, social services personnel, management teams, school staff, health and wellness professionals, youth groups, law enforcement, and more. 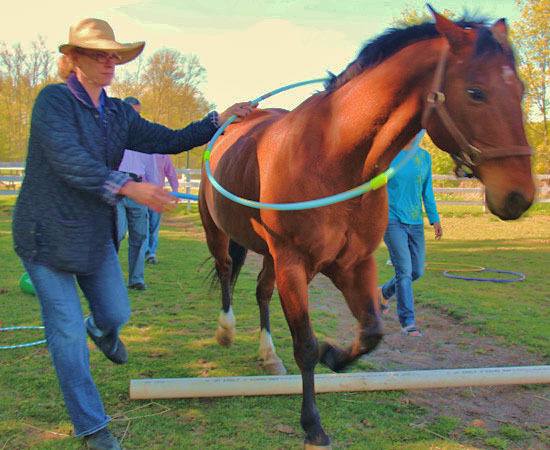 Workshops use the interaction between people and horses as the basis for personal growth and exploring group dynamics. “I volunteered for a team building session. I had no idea what to expect. After just 1.5 hrs I came away with a couple valuable results usable in everyday life. First and foremost, I don’t listen very well!! I hear fine but don’t focus on what is being said. Combining others perceptions and understanding of matters is powerful. Where I didn’t comprehend the initial instructions, others did. As a team, we were able to combine all of our strengths and proceed to solve the task and be more efficient. I highly recommend taking a session,” exuded Peter Sweet, Jr., owner of Seekonk Tree Farm and Sweetwater Landscapes. This is not a riding or horsemanship program: all legs are on the ground, human and horse side by side, ready to learn. The emphasis is on non-mounted activities which incorporate horses and require individuals or groups to discover and apply certain skills. 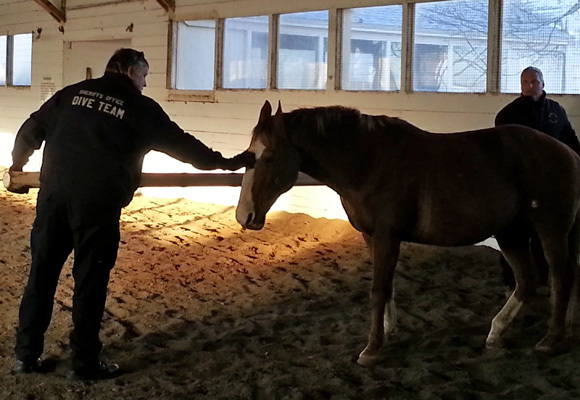 Participants learn about themselves and others by connecting with the horses and then observing and discussing the team dynamics, behaviors, and patterns that arise. What happens in the arena is often a metaphor for one’s life, family or group interaction. Because Equine Assisted Learning is so effective, it is considered a rapid approach to building life skills including nonverbal communication, leadership, empathy, teamwork, assertiveness, creative thinking, problem-solving, taking responsibility, confidence, efficiency and continuity in management. Because horses are innately sensitive and open, interaction with them serves as a mirror of our emotions and our behavior. 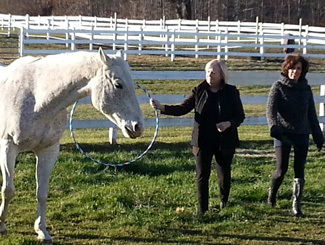 Berkshire HorseWorks™ sessions help individuals, couples, and groups discover positive solutions to real-life challenges. Participants are empowered by the lessons learned in the arena and actually translate that energy, attitude, and behavior when they return to the workplace, the family or school. EAL is an investment in your team that more than pays for itself in terms of camaraderie, productivity and member wellness and retention. The intuitive animals are able to read and mirror the emotions and energy of the people around them, providing vast opportunities for metaphorical learning. Participants, gain awareness and are able to make positive changes in their lives through the horse/human interaction.